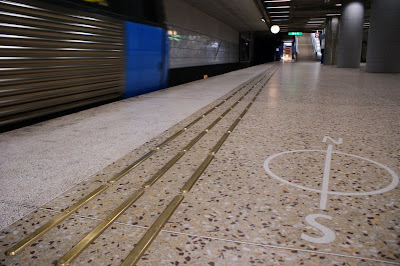 A symbolic compass in the floor helps commuters maintain their sense of direction. Again, this is station Danderyds sjukhus. Any station has several signs giving directions by the platform. "Exit that way for streets x, y and z"
This is more like a compensating measure for the fact that we're underground. And a simple decoration, mayhaps? You are right in both cases, I like to know my position but find difficult to think that many others care. Anyway it's a simple and useful decoration. The subway is a superb means of transportation but one drawback is the fact that stepping down into one "hole" and coming up through another one doesn't give a very good sense of the local geography.